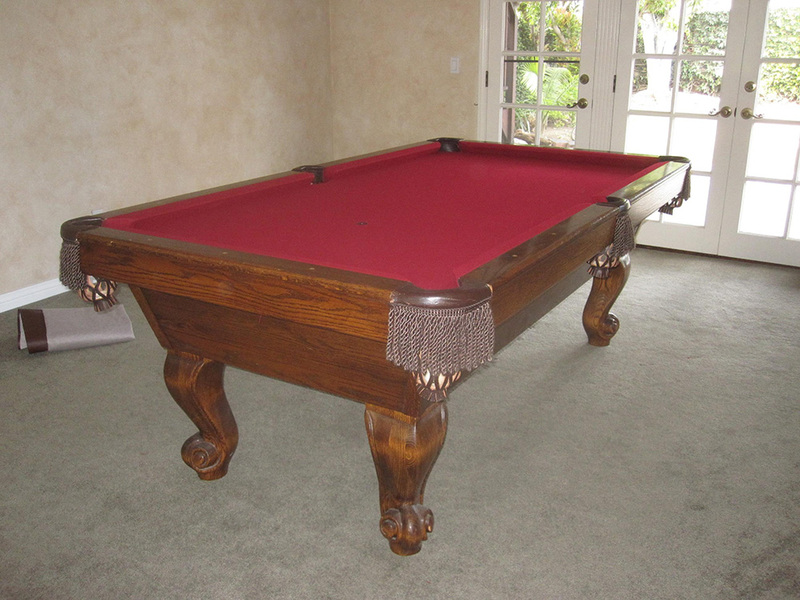 Here is a seven foot Murrey and Sons pool table from Los Angeles, CA. 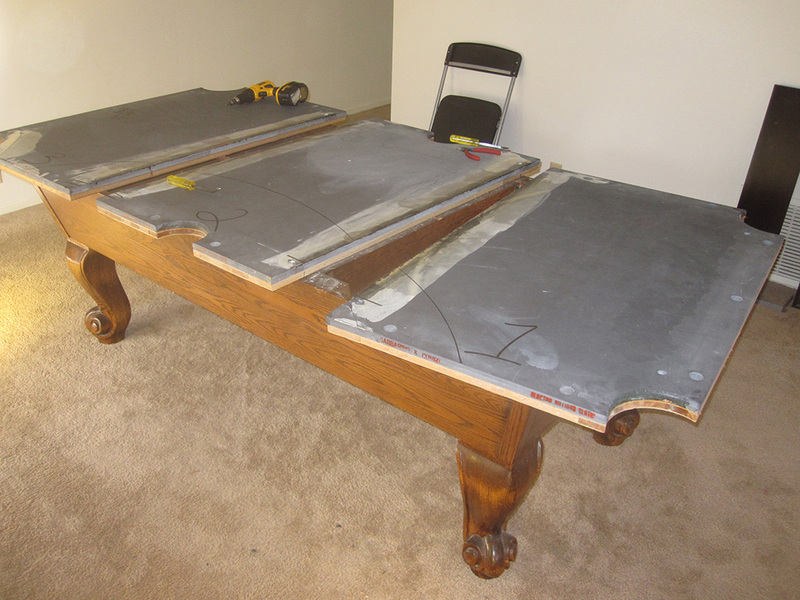 We moved this slate pool table for our clients who were relocating within Placentia, CA. 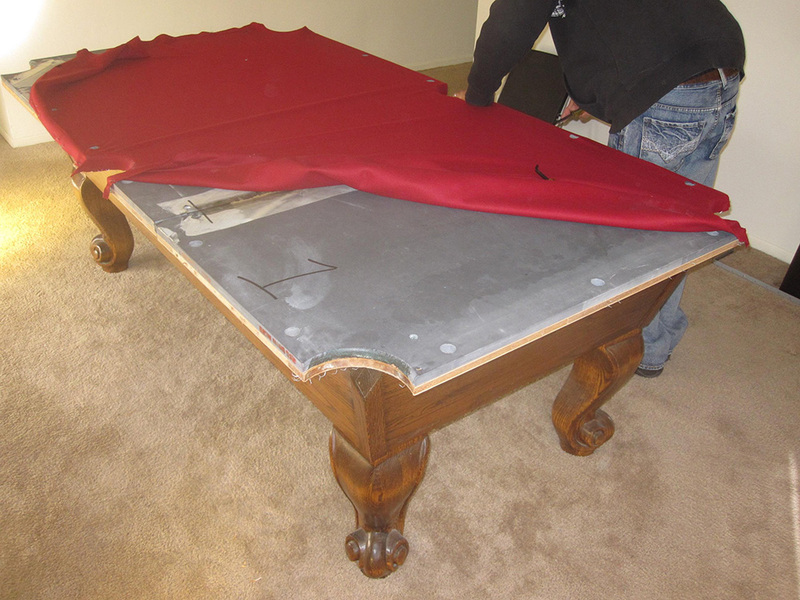 The homeowners had professional movers handle all of their household furniture, but did not want them to touch their pride and joy pool table. 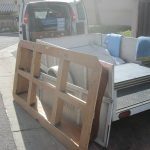 Most reputable moving companies will advise their clients to hire professional pool table movers due to liability reasons. 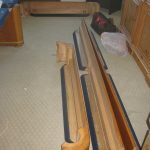 We also have simply disassembled and crated pool table slate before and allowed the movers to transport the pool table pieces. Usually this only happens when the client isn’t moving directly into their new home and all their belonging go into storage for the interim. 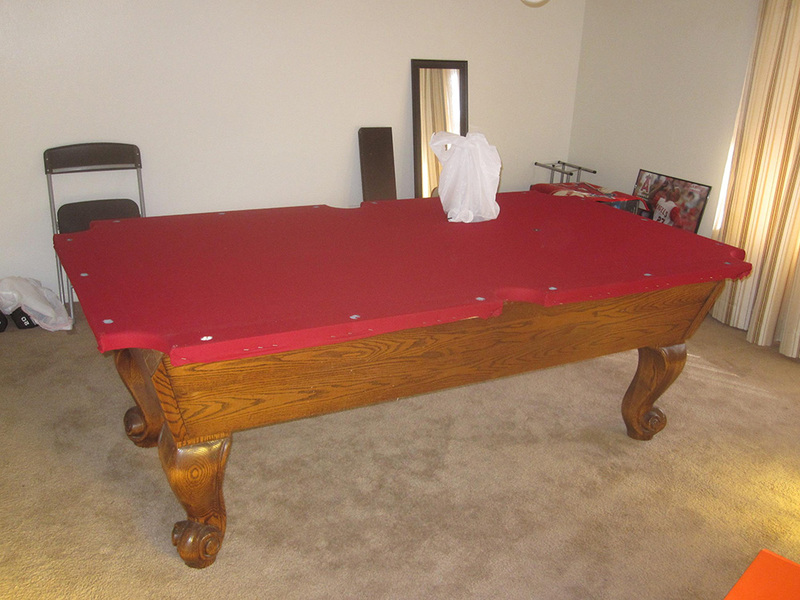 Please see our pool table service page for a list of all our professional services we offer. Just had a quick question pertaining to the same table mentioned above. I just bought a used one and planning to pick it up and assemble in my own home. Is there any way without comprimising the table that i could take the legs off and have the main unit as one piece for transport? 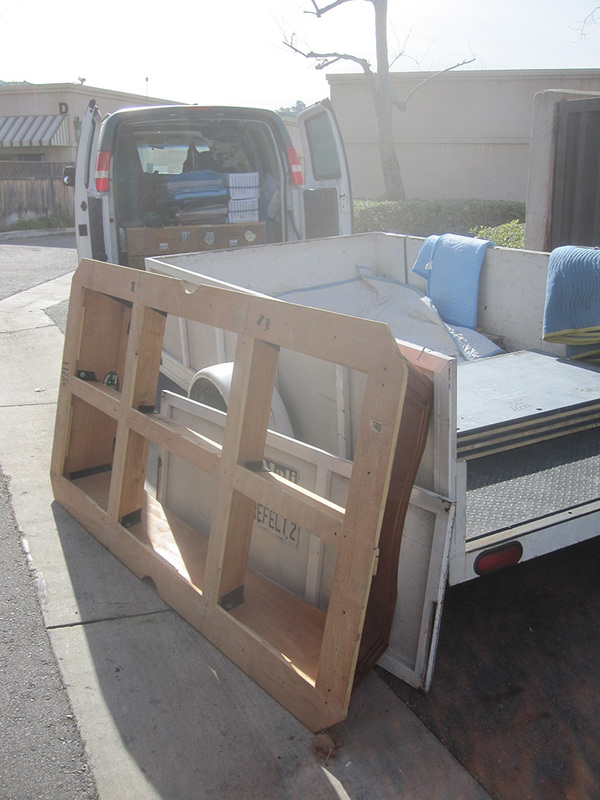 I have moving dollies, straps, moving blankets tape etc… and an electronic lift gate on my straight job truck. Any if all information would be greatly appreciated. I baught this pool Table by an old guy. The Brass plate says Custom Made by Murey & Sons co.Inc. Just want to find out the price on the Table. Wow, a Murrey from Los Angeles made it all the way to South Africa, cool! So I’m not sure of pool table values in your area but I would guess it is probably worth about $1000 US.Best regards, PTK. 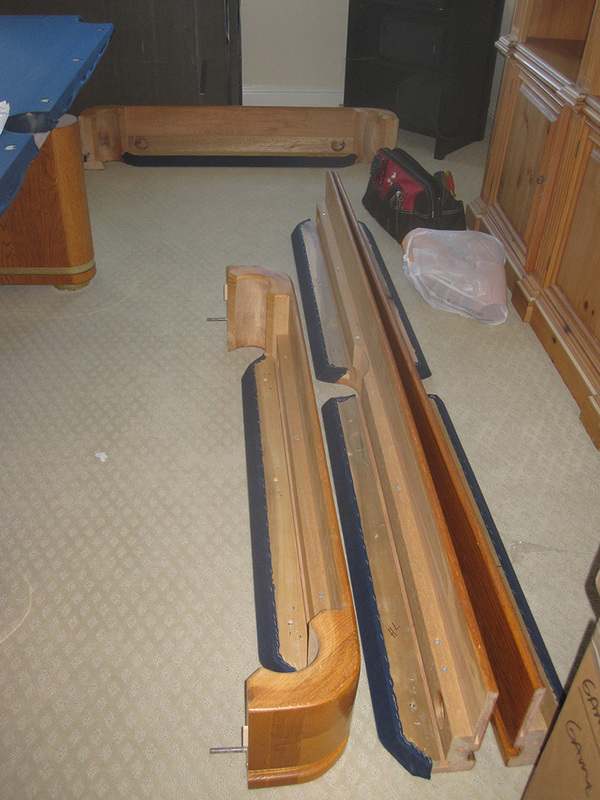 I want to sell my Murrey 4X8 Calif./8 Oak Pool table which I have had for 20 yrs. Part # at sale is 1227. Dark green cloth Black Fringes. Excellent condition. Paid $2600.00. What is a realistic selling price to ask? Good morning Austin and thanks for your question. 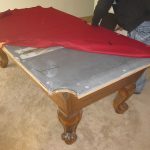 One good thing you have going for you is the model pool table you have, the Californian, is a very well made pool table. On the other hand it’s a 20 year old used pool table and it’s right around this time that things start to deteriorate, mainly the cushion rubber. The person buying your used Murrey may have to replace all the cushion rubber and possibly the leather netting on all of the pockets. 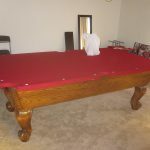 Plus you’ll have to factor in the cost of having a professional pool table mover relocate the table to the new owners home. 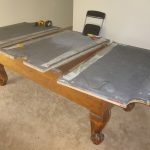 If you factor in the moving costs and the future repairs needed, I’d say you should ask somewhere between $1000-1500 for your used Murrey pool table.